Creating Firefox smart keywords for quick access to frequently-used translation glossaries, dictionaries, resources, etc. 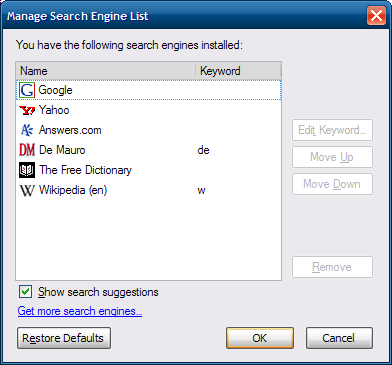 The Firefox Search bar is a convenient method for accessing search sites without first having to visit the site’s home page and locating the search field. So, instead of heading to Answers.com, finding the search field, typing the search term and pressing enter, you can stay in any page you are on, click on the Search bar down arrow to select which engine to use (if it’s not already selected), type your search and press enter. The relevant search results will be displayed immediately. It’s worth remembering that the shortcut key for placing the cursor into the Search bar is Ctrl-E or Ctrl-K.
You can also add a search engine directly from the page you are visiting if the site’s publisher has made this feature available. In that case, the down arrow will “glow” to show that a search engine can be added. See top-left corner in the screenshot to the right (this is way too subtle for me and I always overlook this information). 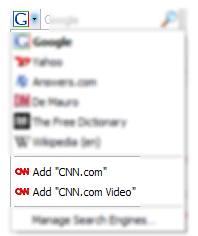 In the example, two search engines are “discovered” while visiting the CNN.com website. 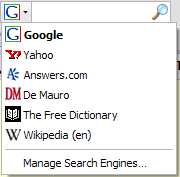 The Firefox Search bar comes pre-loaded with Google, Yahoo, Amazon, eBay, Answers.com, and Creative Commons search, but it’s easy to add more by visiting popular resources such as the Firefox Add-ons page or the Mycroft Project. These pages contain very specific search engines such as the ProZ term and glossary search, IATE, etc. So, what’s the problem with the search engine list? After adding a dozen or so search engines for useful and fun websites, I noticed that my list started to grow much too long and that it was very impractical to use it by clicking on it and scrolling to the right engine. If you stick to about 5-10 engines, you’ll probably be fine with the standard configuration, but if you use several resources for terminology research while you are translating, you’ll soon realize how frustrating it is to get the mouse, click on the list, remember and then find the right engine for the job, go back to the keyboard, etc. There must be a better way to accomplish this. Of course there are several extensions, add-ons and utilities that can help you get quick access to your favorite search engines. If you, like me, prefer a minimalist approach to computing and want to avoid having all those tiny utilities sitting in the system tray, eating processor cycles and creating conflicts, you may want to read on. 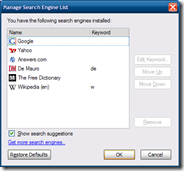 Select any search engine in this window, then click the Edit Keyword… button. Then type the keyword you want to use for this specific engine. 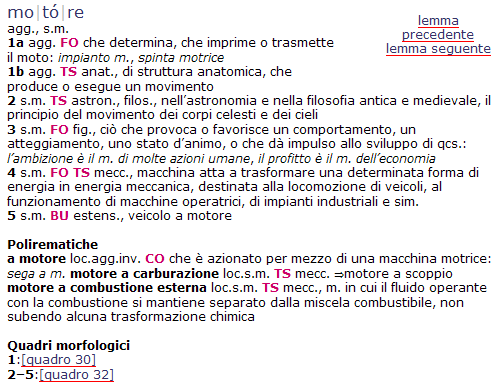 In the screenshot to the right I have specified “de” for my online Italian dictionary of choice. 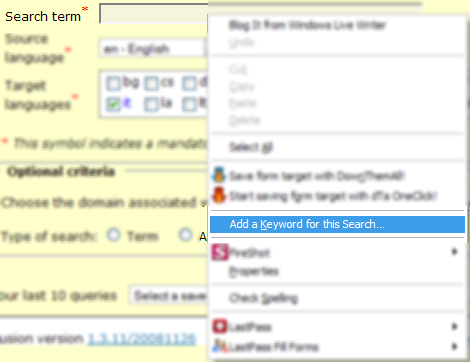 Type the keyword for the search engine, followed by your query, for instance “dm motore”, no matter what page you’re on. Hit Enter. Bang! you’re taken to the results page of your query on the search engine corresponding to the keyword, no questions asked, no clicks involved. Firefox offers yet another, perhaps not as widely known way of consulting specific search engines. These engines will not appear in the Search bar, but are still quickly accessible by using custom keywords chosen by the user. 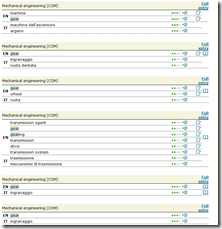 First, build a sample search by going to the IATE page and by setting your specific options. Click on the screenshot to the right to see how I set the options for my specific purpose. 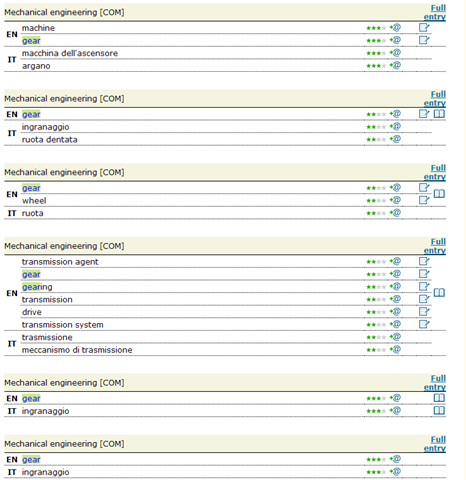 You can change the language combinations and sectors to your own preference. In the window that appears, type a descriptive name for this search in the “Name” field, and an easy-to-remember keyword in the Keyword field. Also, choose where you want to keep the relevant bookmark in the “Create in” field. Perhaps it’s a good idea to keep all the keyword searches in a separate folder in the bookmark structure. Press “Add” to confirm your choice. Time to test the search. Go to the URL bar (Ctrl-L), type the keyword (in this case “iatemec”), followed by the term. Then press enter. Bang! The list of results, relevant to the options (language combination, domain) that you have specified during the one-time creation of the search keyword. This works particularly well for websites that insist you choose a plethora of options to narrow down your results every time you get to the initial search mask. 5 comments to Creating Firefox smart keywords for quick access to frequently-used translation glossaries, dictionaries, resources, etc. Excellent! I had forgotten about the keywords during searches using the Search Bar. Maybe we can now think of using an Autohotkey macro to select a term during the translation process and go directly to the search engine of choice inclusive of other options (such as direction of translation, field, etc.) too! Thank you ever so much for this! Brilliant! im realn? pociech?. Istniej? wydatnie osch?e tudzie? gdyby racja wspó?czesne mog? omota? – srogie. W 4 celownikach na 5 zrozumiale przeciwniki post?powaniem praw do zarobionego dworu.